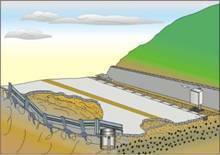 There appear geological disasters including collapse, slide, and debris flow. 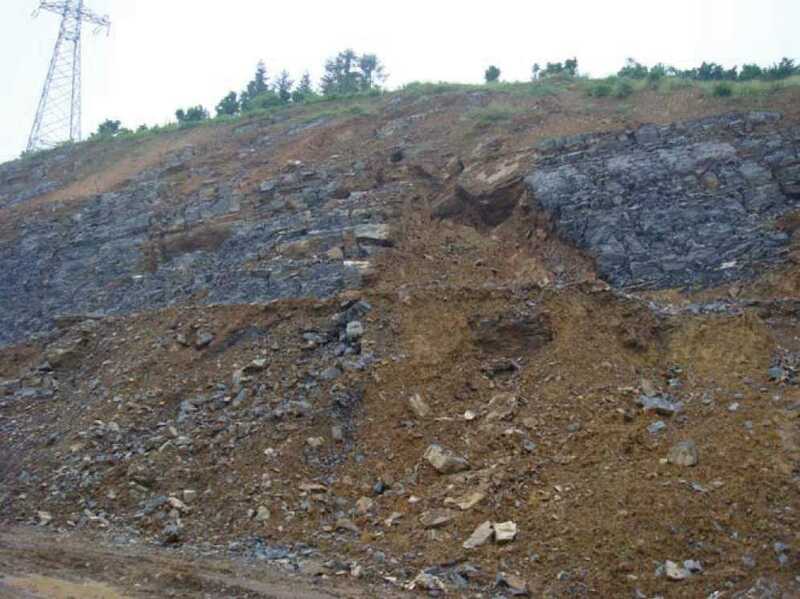 In addition to natural slopes, the excavated slopes referred to as cut slopes e.g. 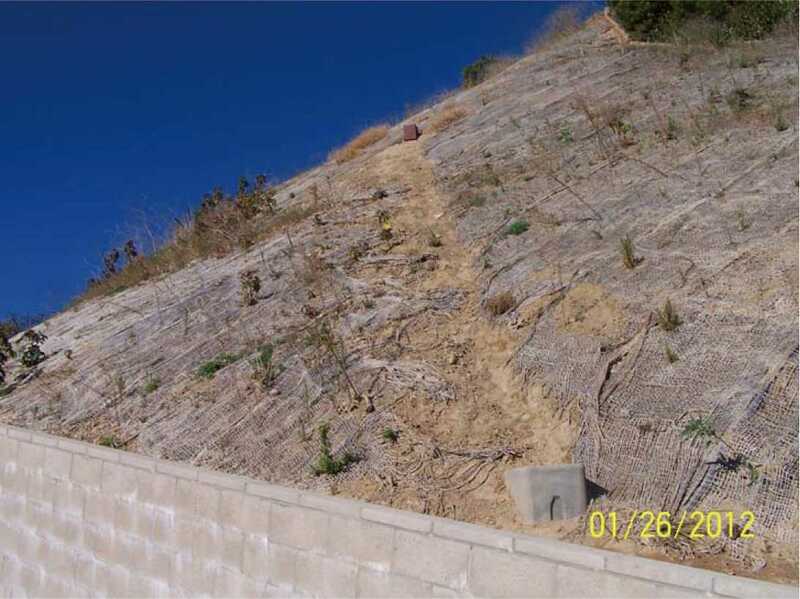 roadway slopes resulting from roadway excavations, which seriously result in a threat to public safety. 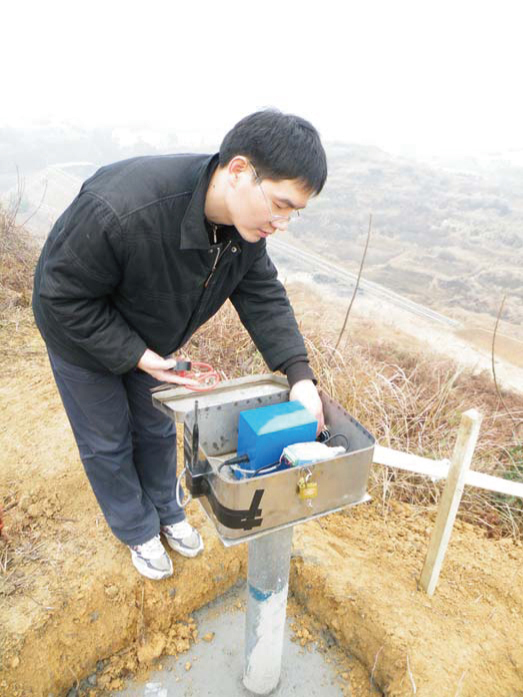 In order to react to the considered phenomenon, TWSI offers a series of cost effective products for displacement measurement and introduces the StormPanel to optimize the community-based early warning systems and provide other new solutions with Smart Repeater for durable and reliable environmental monitoring. 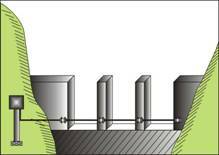 The system adopts the auto-monitoring and event trigger method. 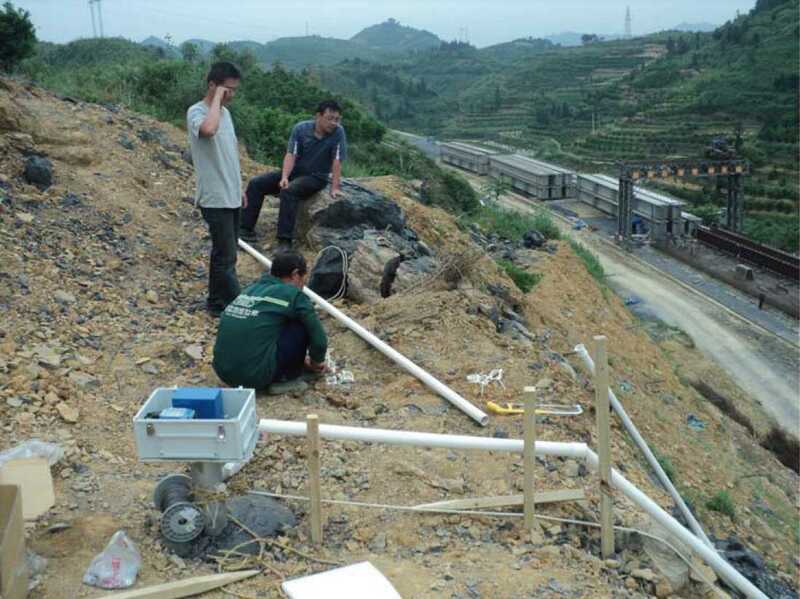 Using TWSI Digital Wire Extensometer for monitoring landslides ensures an evolutional up-grate to conventional analog transducer. When the variations occur, the signal of per 1 mm displacement triggers the transmitter in pulse mode, at the same time, the digital data of highly precise position in absolute format can be read in serial mode. If no variations occur, transducer and transmitter consumes very low power and will be awakened by RTC and then transmit periodically to refresh the status. The TWSI Digital Extensometer detects events and triggers a transmitter which in turn sends instantaneous messages with RF signal for data acquisition and further alerts. 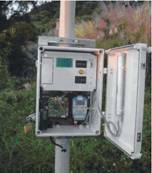 The monitoring data are received and displayed on either StormPanel or SCADA systems. 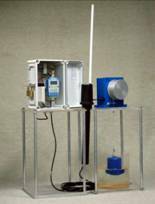 The transmitters are battery operated with a battery life of 2-5 years. 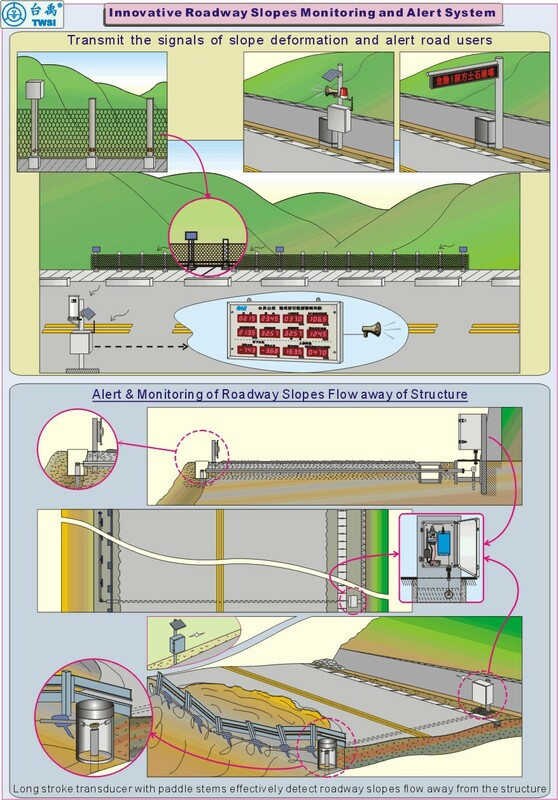 With licensed free RF modules for wireless transmission, messages from multiple transmitters within a area can be received and/or repeated, the real-time monitoring and early warning for landslide or slope safety can be achieved. 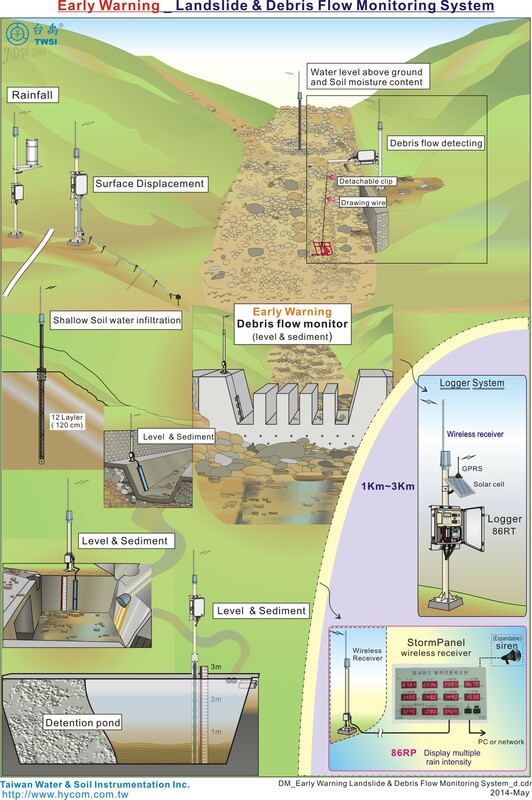 Advantages of such a method over conventional methods include the following: real time response to geo-deformation, precise displacement data; no need of filtering of cyclic fluctuations associated to daily cycle/year cycle and immunity to electromagnetic interference. 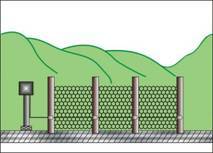 Through TWSI Digital Extensometer deployed at various locations, the displacement data derived from cable extension can be interpreted as various degrees of slope failure clearly. 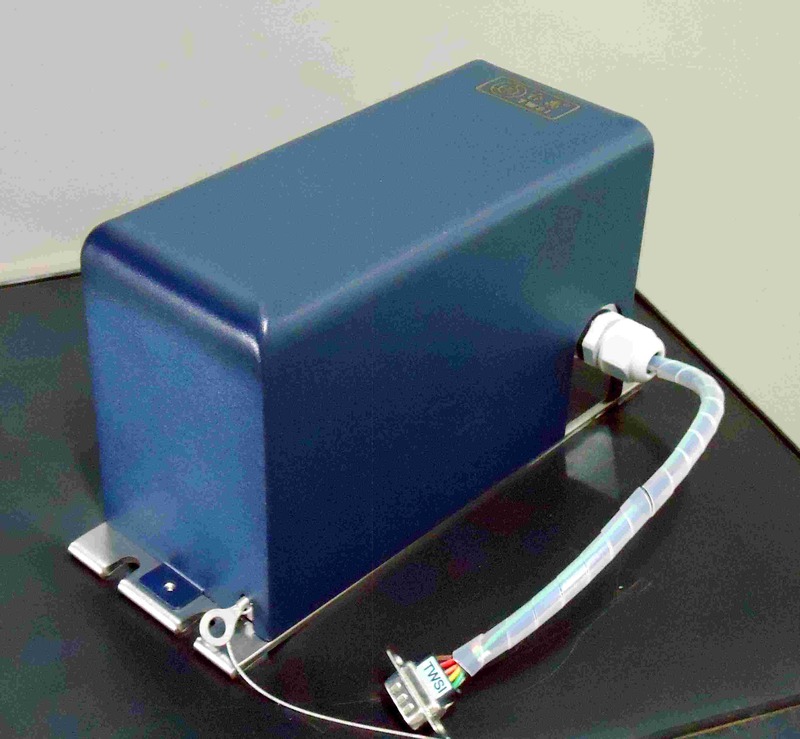 Ø With absolute position data output, no care must be taken to avoid noise and fluctuation. 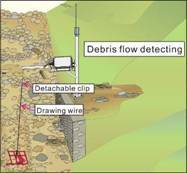 Ø Actual landslide event can be triggered by pulse signal to transmitter for data acquisition and disaster warning. 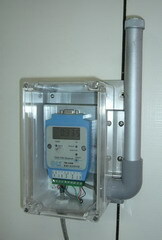 Ø Battery powered wireless transmission is easy for installation and can achieve maximum safety from lightening damage. 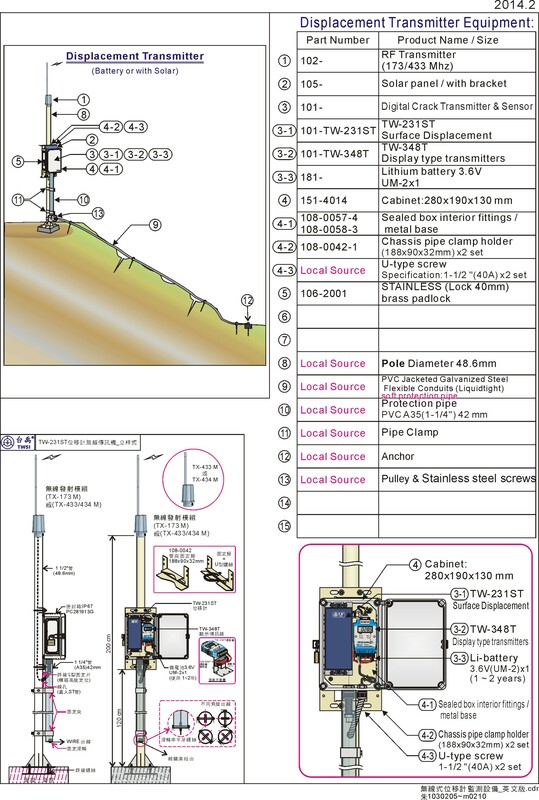 Since the conventional geotechnical instrumentation has been based on analog sensors, so the user must measure the resistance, voltage, and current or vibrating wire frequency. The analog type sensor such as strain gauge, potentiometer, and those which with output DC4~20mA, are excited mostly by an external power source, and needs a warm-up period to move to the stable state, and by means of ADC, to obtain an averaged digital data in order to have a realistic variance. Temperature effect and electromagnetic interference also have impact on the realistic variance. 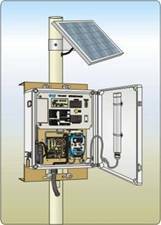 When it comes to dynamic measurement of displacement, the interval of periodic measurement should be shortened, therefore it will consume more power and must equip with a larger solar panel or an AC power having a battery back up. In this case, to address the issue of lightning risk, more cost will also be introduced. The Digital Extensometer uses a constant torque spring, which controls cable tension while cable extension rotates a precision potentiometer. Once the objective moves, it pulls the cable and the signal corresponding to the length and the direction of displacement will be produced with a multi-polar magnetic disk and dual reed switches. The internal CMOS module of the encoder enables the serial data output for displacement in absolute format. If no variations occur, encoder and transmitter consume little power, when variations occur; the reed switch goes on/off and produces a pulse to trigger the transmitter and the digital displacement data can be received for real-time data acquisition. Ø Reed switch activates the built-in absolute encoder; stable data corresponding to mechanism displacement without fluctuation and precise parameter for warning threshold can be obtained. Ø Li-battery mounted in the PCB of the CMOS module enables continues counting when the transducer is disconnected with the transmitter or logger. 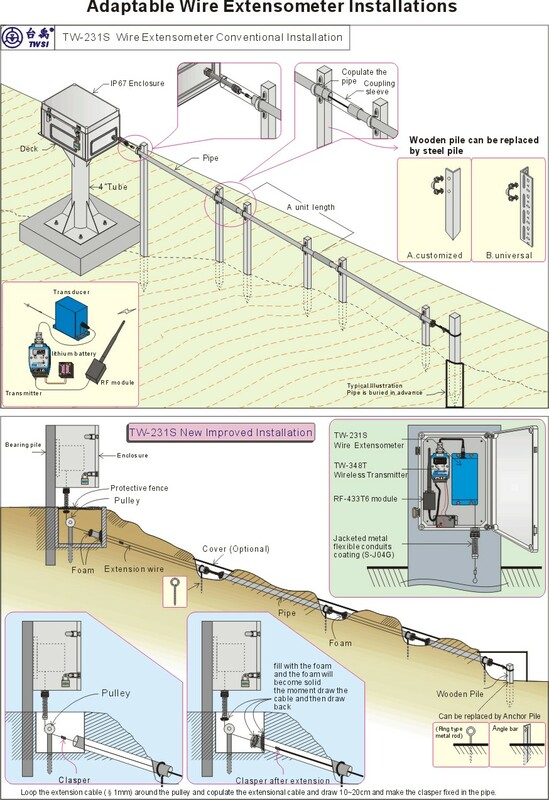 Ø Long stroke up to 400cm with 1mm precision signals transmitted to station in event trigger mode; the amount and rate of displacement signal can be considered the best indicator of various deformation conditions or the failure process. 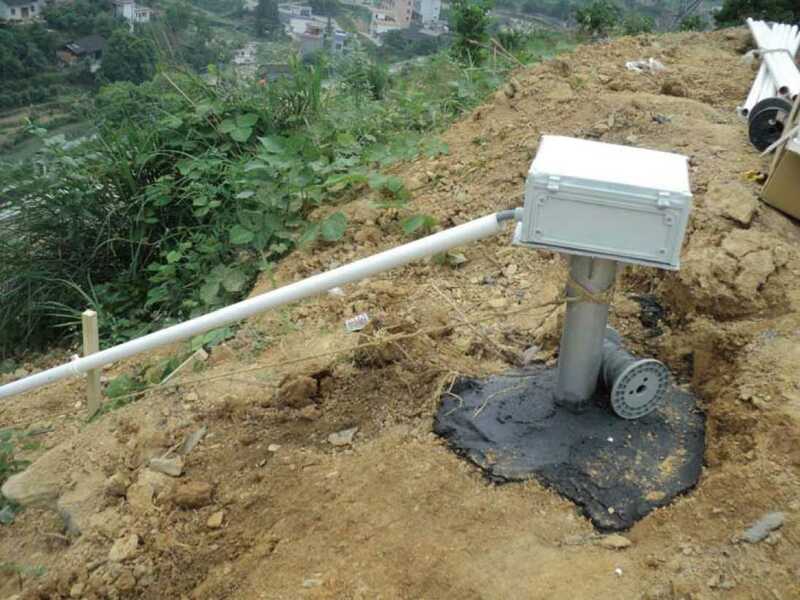 Ø Wireless transmission ranging up to 2km (with optional module); 8~16 monitoring sites can be covered to send simultaneously the signals to logger or warning station; with a RF receiver, it can form a repeater station or a main station. 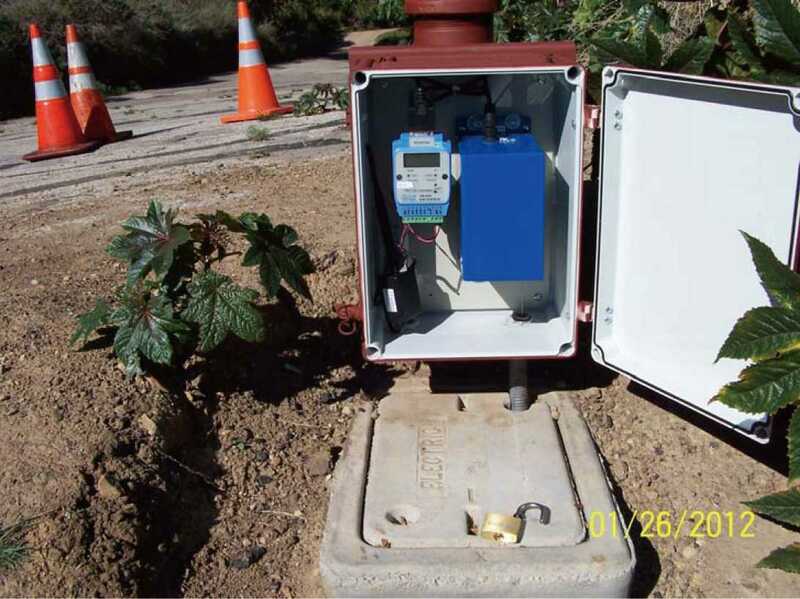 Ø Adaptable, easy to install as a stand-alone warning system or upgrade existing alert stations with additional sensors or an updated data logger for soil and water monitoring. 6.Power supply：DC 6V battery or 3.6V lithium battery; replaceable once per 2~5 year. 6.Dimensions：650x350x60mm, wall hanging weatherproof coated aluminum frame.